Valuable Handbook for Successful Internet Marketing. Matt Bailey is a true, authentic, holistic authority on web marketing. Matt’s approach is to take his experience and expertise and apply it for practical, tangible, results. His book “Internet Marketing: An Hour a Day” fits this useful philosophy precisely. He provides a fantastic overview on the key factors involved in successful internet marketing… then dives in to teach the details and effective steps and actions… the vital “how to” needed in order to make things happen and so you can WIN at internet marketing. 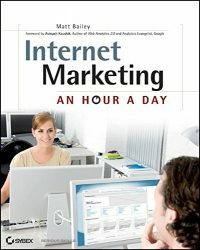 This is a book you should read if you are involved with Internet Marketing, at any level. I hope my competitors never read this book!